On December 04th, 1991 Pan American filed for bankruptcy. When Pan Am was terminated, it was a tremor 8 on the scale of Richter in the world of commercial aviation ! It was an unprecedent event, to see such a major player in aviation's history go down. Pan American World Airways was founded in 1927 and they used a rented flying boat for their first flight on October 19th of that year. With Juan von Trippe leading Pan Am, the company was a power tool for the US Government in their international affairs during those early years. 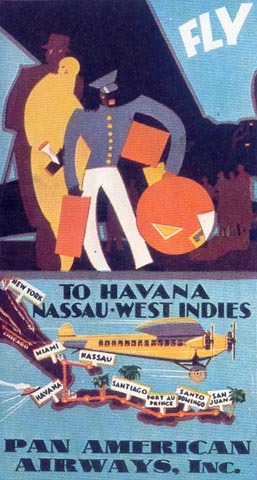 Many first steps had a pioneering nature, like the shareholdings in several national airlines (Aeronavas de Mexico, Panair do Brasil, Cubana, West Indian Airways). Till the introduction of the DC-3, the (overseas) routes of Pan Am were flown by flying boats. During World War 2, Pan American took over the formerly German-influenced companies in South America. The company was also active with logistical support for the war and flew many transport aircraft. After the war, Pan American "inherited" over 90 Douglas DC-4s and thus its operation changed to a land-based affair. Lockheed L-049 Constellations were used from 1946 for trans-atlantic flights, later followed by luxurious Boeing 377 Stratocruisers. In 1949 AOA-American Overseas Airlines was taken over with their routes to Scandinavia and Germany, including their internal services to and from Berlin. By 1951 Pan American World Airways had a world-spanning service in place; DC-6s and DC-7s were introduced during the early 1950s, which were replaced during late 1958 by Boeing 707s on long-range routes. It was Pan Am who ordered 20 707s and 25 Douglas DC-8s in 1955, thus throwing the door wide open to the jet age ! Pan Am was also instrumental in Boeing building the 747, which was first introduced on the prestigious New York - London route on January 22nd, 1970. Mass transport through the air had made its introduction. Pan Am was also active in various shareholdings (25% in National Airlines) and had interests in hotels. National Airlines, a large US domestic player, was taken over in full during 1979 and thus Pan Am had a large internal US network which it had previous lacked. But after deregulation, Pan Am lost its previous position of strength on international services and after the merger with National, financial problems started in earnest. Pan Am sold its headquarters in New York City, sold routes and aircraft. Airbus A300s and A310s were leased, they were cheaper to operate and more profitable than the first generation of wide bodies. But it was not sufficient to turn the company around, it continued to publish losses. After the fall of the Berlin Wall, the German routes were sold off to Lufthansa and on January 08th, 1991 Pan American sought the protection of Chapter 11 of the bankruptcy law. Only the profitable Caribbean routes remained, but these earnings could not cover the mounting debts. Finally, on December 04th, 1991 Pan American filed for bankruptcy. The name Pan Am was sold on by the liquidator and have since been used by start ups, trying to built something on that famous name. But there was only one Pan American World Airways and its glorious history came to an end in 1991. Its ICAO callsign was Clipper and the flightnumber prefix was PA or PAA. On the photo we see Boeing 727-235 N4753 (cn19473/606) taking off from runway 24 of Amsterdam Int'l some day in 1985, no doubt with a destination in Germany. This aircraft was broken up at Miami in March 1993.